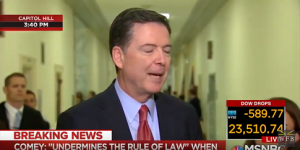 The exchange came after Comey finished his second closed-door interview with House lawmakers, during which he answered questions about the Russia and Hillary Clinton email investigations. Last summer, Comey admitted in open testimony that he gave memos detailing his conversations with President Donald Trump as FBI chief to a friend, who then gave them to the New York Times, Townhall noted. Comey said that he asked his friend, Columbia Law professor Daniel Richman, to share the memos "because [he] thought that it might prompt the appointment of a special counsel." The Times reported that the memos revealed that Trump asked the FBI to drop its investigation into former national security adviser Michael Flynn while Comey was still director of the agency. Those memos formed the basis for Mr. Comey's testimony in front of the Senate Intelligence Committee last year, in which he accused the president of trying to shut down an investigation into purported Russian interference in the 2016 election. The president has denied trying to thwart the probe. Mr. Comey's tactics were successful—special counsel Robert Mueller was appointed shortly after he was fired as FBI director. Mr. Comey's memos are now part of the wide-ranging probe being conducted by Mr. Mueller into Russian interference in the 2016 election, as well into whether Mr. Trump obstructed justice when he fired Mr. Comey last year, allegations that Mr. Trump denies. Russia has denied interfering in the election.